Friday evening I went to check the craft section of my favourite Fnac store in Paris (because it has a big craft books section). I caught a couple new releases that I’m going to share with you. 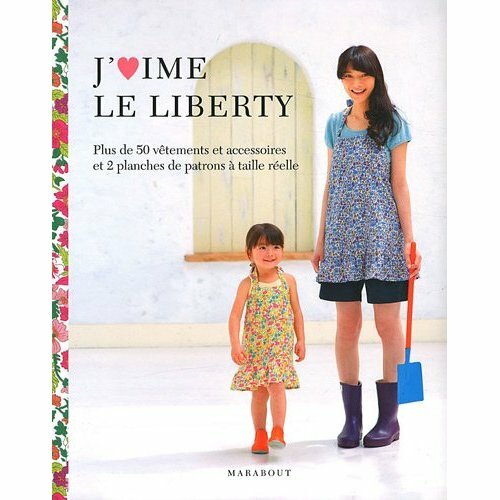 First today is “J’aime le Liberty” (or “I love Liberty”), a new translation of a japanese craft book. I forgot to take a picture of the cover so I’m showing you the official picture I found on the Internet. I was suprised how nice the print (Caesar if I’m not mistaken, I forgot to look up the name in the book…) works for this dress. I already knew this fabric, but wasn’t sure how it could be used, because of the big and busy print. I think they did a wonderful job here: the big print works well for a long dress, and the flowing skirt and bottom frill go well with the feather print and add fluidity to the structured motif. Okay maybe I’m overthinking here, but I like this combo. 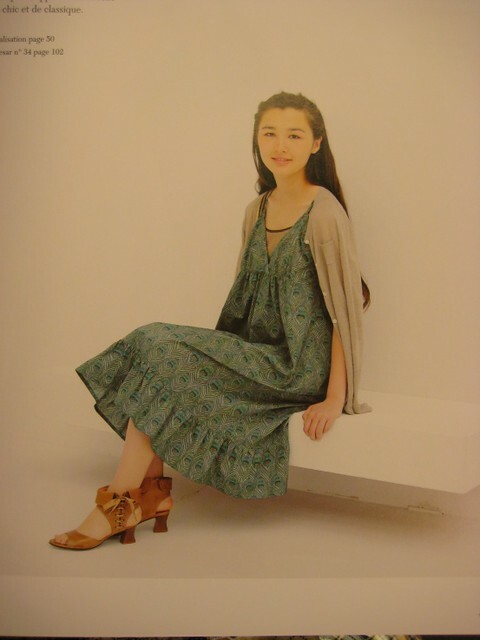 The clothes style is quite classic for japanese books. Nothing really caught my eye because I already have a good number of japanese sewing books, but others seem to like it. You can see some more pictures on those blogs: Lalouandco, Elle vit sa vie, Flo’p. Last week-end we went for a two-days stay abroad with some friends. We left on Friday evening and came back yesterday morning. It was really nice! Here is a little puzzle for you (that will also explain why I’m talking about this trip here): judging from the picture below, which shows some of the items I brought back, can you guess were we went? So the answer is: we went to London! Our friends lived there for some years, they shared their favourite places with us. It was my first time going to England. Of course we had to go admire the beautiful Liberty shop. I’ll share a few pictures once they’re sorted. 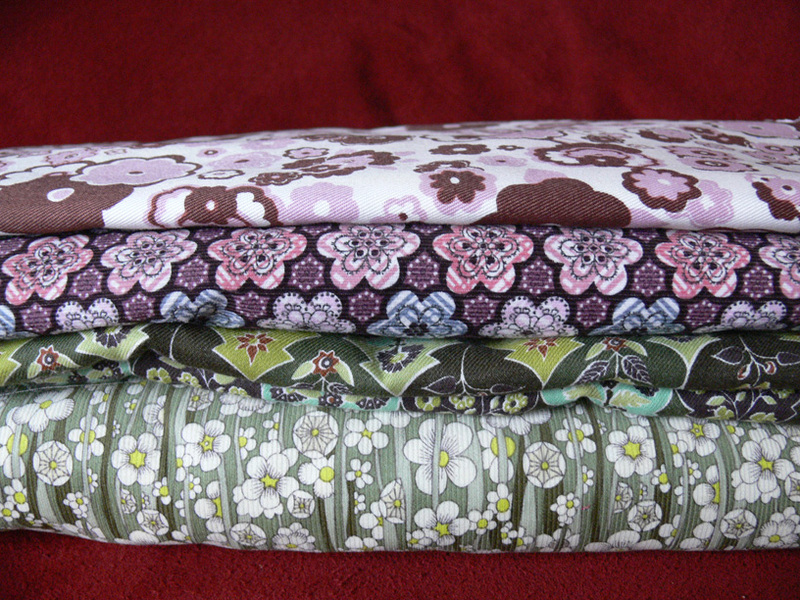 But it wasn’t there that I bought my fabrics. Liberty is less expensive than French shops, but Shaukat is even less expensive. Something I found quite funny: the place was filled with french women! There were at least 6 of us, and I’m not sure I actually saw an english speaking person while I was there. Are French people especially found of Liberty? Do all french sewers go to Shaukat when they’re in London? Two corduroy fabrics (I love corduroy, and it’s not easy to find some around here, especially this cute), a cotton-wool blend and cotton twill. Now I have work to do! I hope to quickly transform all this into nice garments, so that I can enjoy pretty winter outfits. A wool skirt would be nice considering the crazy cold temperature they predict. For now I’ll just go to bed, since I caught a cold with all this walking outside with the cold temperatures we have right now. I wanted to add more pictures to this post, but it will have to wait as I’m not feeling well at all. Sorry! When I finally got some time to myself this Saturday, I decided to turn to a project that had been delayed for too long: the makeover of my Menasse necklace. Has you might remember I wasn’t so happy with it. It was cute but I felt I wouldn’t wear it much. I was right, so I designed another version of it, this time in the form of a very long necklace. 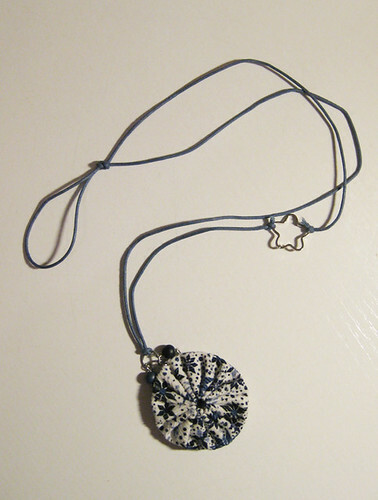 Problem is: I’m still not 100% happy with it… ^^; That’s why I didn’t cut the leftover cord at the top of the necklace. I had a really precise image in mind, and this doesn’t fit perfectly. It’s nice, but some part have an annoying behavior. The tiny pearls are made of wood, and the yo-yo is of course made of fabric, so the bottom of the necklace is very lightweight. Since the blue cord I used isn’t very strong either, and there’s no real weight at the bottom to stretch it, it has a tendency to get a life of its own, and take strange angles. It’s getting a little better with time since it’s losing its factory folds though. The other problem I have is with the ring connecting the cord to the pendants. It’s not metal as I thought but some lightweight grey material. I don’t know why but it’s constently turning to the side when it shouldn’t, so that the yo-yo also turns. So much so that it spends more time showing it’s side or back than its front! 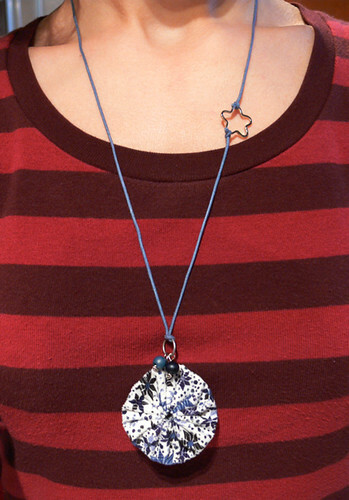 Here is a picture of the necklace worn, where the yo-yo is okay but you can see that the ring is turning. Material:blue cord, light colored pearl, ring @La Droguerie Paris ; yo-yo made of Liberty Menasse bought at Shaukat ; dark colored wooden pearl bought at Loisirs & Création ; other things bought in Japan. Here is a picture to confirm what I wrote about the other day. Sorry I didn’t think of looking for a picture the day I wrote the post (I’m going to edit it right away). Looking at it I understand why I recognised it so easily: this Liberty is called Lauren and is one of the first Liberty print I liked and learnt to recognise. It’s so distinctive from other kind of prints, it’s easy to spot (unlike some of their more traditional floral prints). 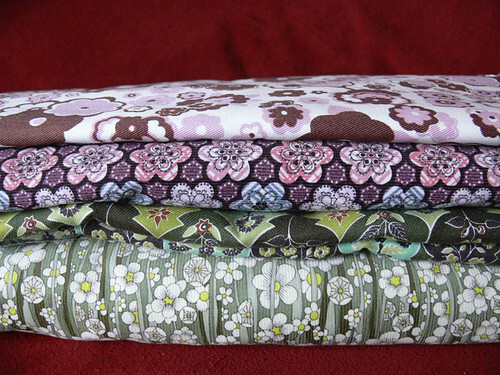 How do you know that yes, you really are addicted to fabric? Easy! When watching the first episode of The Mentalist on TV, you suddenly exclaim, in a very excited voice: “Oh my god! It’s Liberty fabric! I’m sure she’s wearing a Liberty blouse!!”. If there are people in the room who are not very close to you and used to your weird interests and habits, I think your reputation might suffer a little… ^^; Luckily for me I was alone with my husband. I googled it a little after, to find that I’m not the only one who noticed. It’s nice to know you’re not alone. 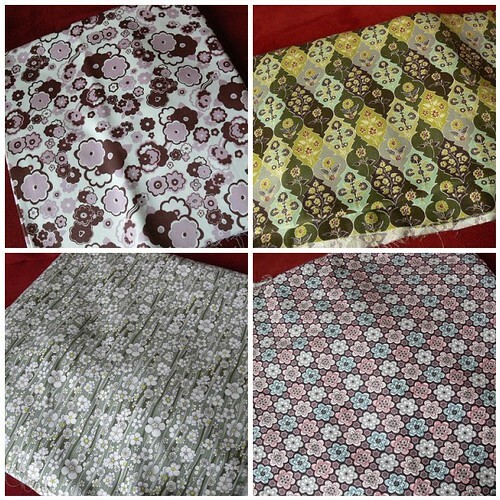 ^^ And you, have you ever spotted that a particular fabric was used in a movie? I’m sorry that I’m not blogging more lately. I’m very actively looking for a job and that takes most of my time and energy. Plus my husband started his new job last week, and we need a little time to adjust to the new schedule. But I’m still here!